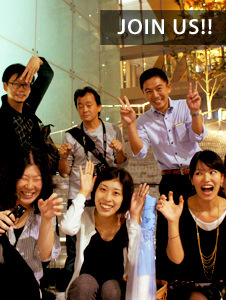 Noriko　：Before I started working at LPA, I taught English to children at elementary schools and at my home. I have always really liked working with children. Mr. Mende, how did you come about starting the children`s workshop? There was actually some very surprised staff at LPA!! Mr.Mende　：Children nowadays are exposed to an excessive intake of light and I want them to have the opportunity to experience just a small flicker of light and darkness while they are still young and innocent. I have hope for the next generation that their perception of light and shadow can be reset. But this higher principle aside, working with children is such a joy!! I think it is in my soul that I really like children….and small animals! I am basically a big kid and I want to recover the ability to behave and act freely. I am always saying “learn from natural light.” This is because natural light does not lie. Play and communicating with children is the same. They can make you aware of so many things. With unanticipated reactions, children are admirably hardy. Noriko　：There is one thing that I am curious about. Even a small, one-year old, baby has the strong motivation to make the workshop crafts by themselves, but adults are always lending a hand so they won`t fail. For example the candle might melt the plastic bottle or the shape is odd; I want them to try and fail and to try and fail, again. I think from here the children can discover new opening and attain a more flexible way of thinking. Parents, of course, do not want their kids to fail, but I want them to be able to think for themselves. Mr.Mende　：As children grow and develop, they learn the rules of an adult society, but rules made by adults are not always based on sound reason. The unpredictability of children is actually not at all a surprise, but sometimes corrects the mistakes of wrong adult “knowledge”. I think the only thing that children are not supposed to do when making lanterns is to set them on fire! If we are just careful about starting fires, I think the rest is thoroughly freeform! Noriko　：My son is always saying that we are the Lighting Detectives so we should go out into the night and be detective-like, maybe investigate heroes and villains. Is there a workshop that you would like to do in the future? Mr.Mende　：Oh, Really. I had no idea! Investigating the night with children…that could be interesting. 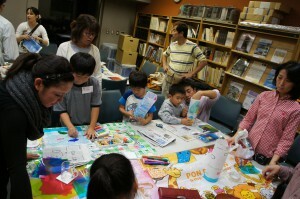 Up unlit now, most of the program centers on lantern making, but we could take the plunge and go out into the night. Also everyone working together to build a future city nightscape might be fun. Everyone cooperating, working in unison, to create one piece. One session might not be enough time, but a 3-part series, maybe with homework, to finish the project. 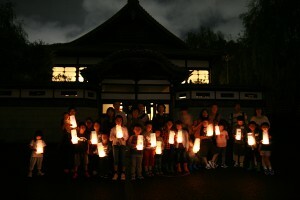 The recent workshop combining lantern-making and Lightup Ninja at the Edo-Tokyo Open Air Architectural Museum was a success! A night walk around the park and in the dark woods was fun, but I turned on the flashlight too early. Next year we will have to do it again, but I won`t turn on the light so quick. Really a great opportunity for children to experience the dark!! 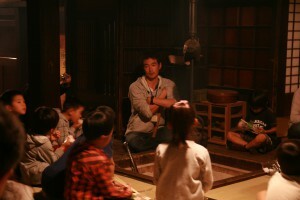 Actually, we are borrowing the children`s energy to test our own limits. Hidden within this play are many lessons to be learned and remembered about light and shadow. As we continue to fill the log with workshop after workshop, the ideal workshop program and methodology will come to form so that not just the Lighting Detectives, but anybody can start by making lanterns together and learning important lessons from the dark. Eventually, I would like to put together a workshop instructional book. So, right now, feedback is important. Not just simple remarks like “it was fun, “ but after each workshop, interviewing children for feedback and recording the content, process, and results will be helpful. We have done about 5 workshops so far?! Maybe not just creating lanterns, but beforehand sketching out a design proposal or drawing up blueprints or putting design ideas into words. After we get about 20 workshops under our belt we should have some really good data and results to show! Noriko　：I am looking forward to planning and implementing more exciting workshops in the coming year and as you said, compiling a record of workshop recipes! Thank you for your time today!